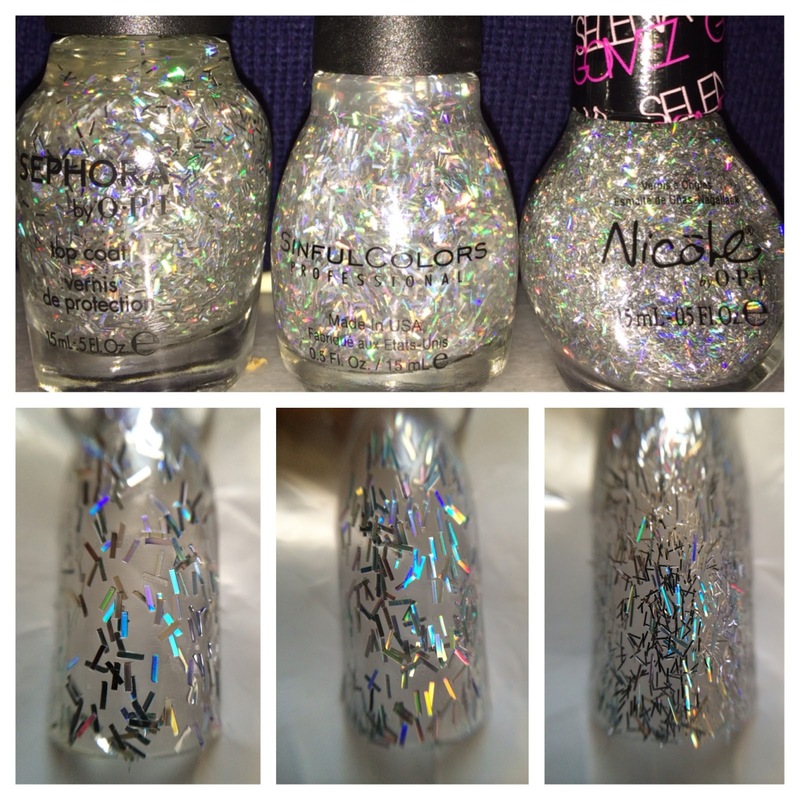 I got my hands on Sparkle me silver from Sephora by OPI at Big Lots the other day and I noticed that I thought I had a few things similar. 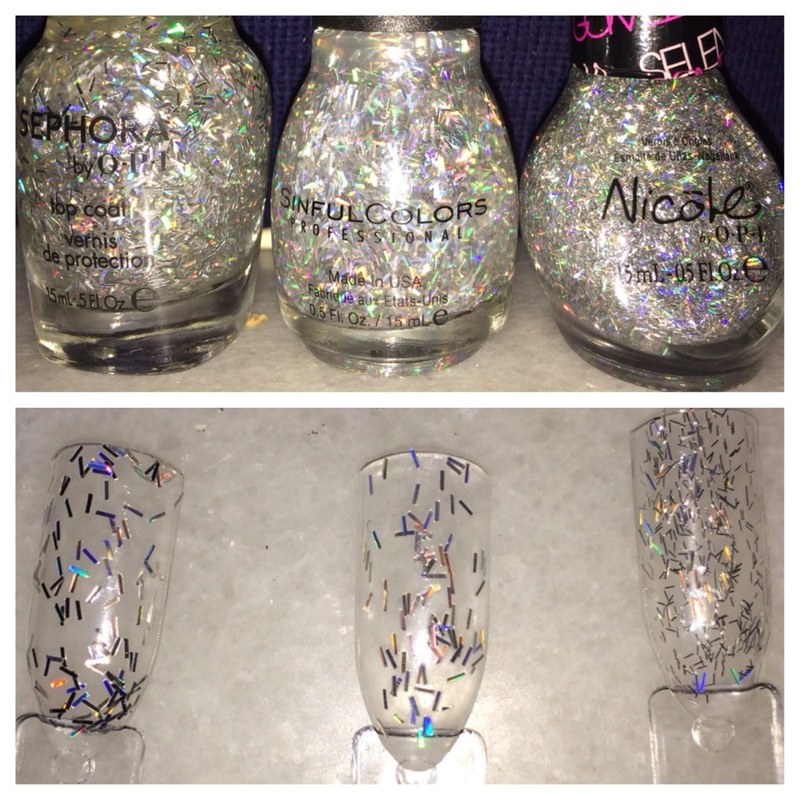 So to my collection I ran and pulled out the polishes I wanted to compare. I swatched these to compare them as I wanted to see if they were dupes. Also this comes in handy if you cant decide from just looking at the bottles of which to get. At first glace at the bottles they look the same but the Macro shots tells a different story. Here you can tell Stars at night is way smaller and definitely not a dupe for the other 2. 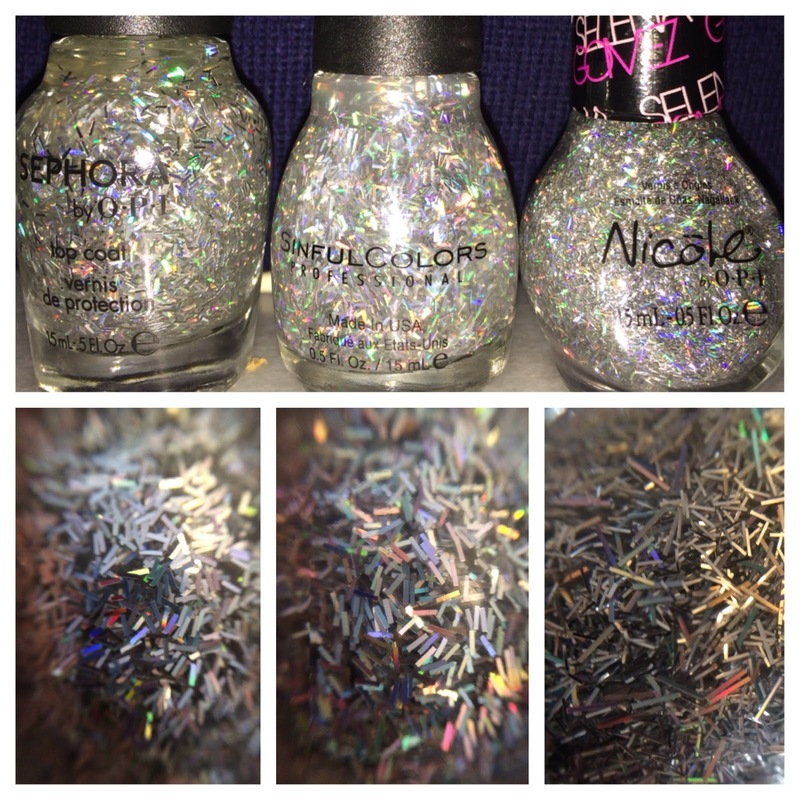 I took the macros in a dimly lit room and here Sparkle me silver and Silver Rainbows look the same. As you can tell the Nicole Opi is definitely not a dupe. If you like small jammed packed bar glitter toppers then this is for you. For me its going into the destash. The SinfulColors and Sephora look identical at first glance. Given a closer look the glitter in the Sephora are shorter and just slightly pudger. In a room with normal lighting thought the SinfulColors has the best rainbow payoff of the 2. 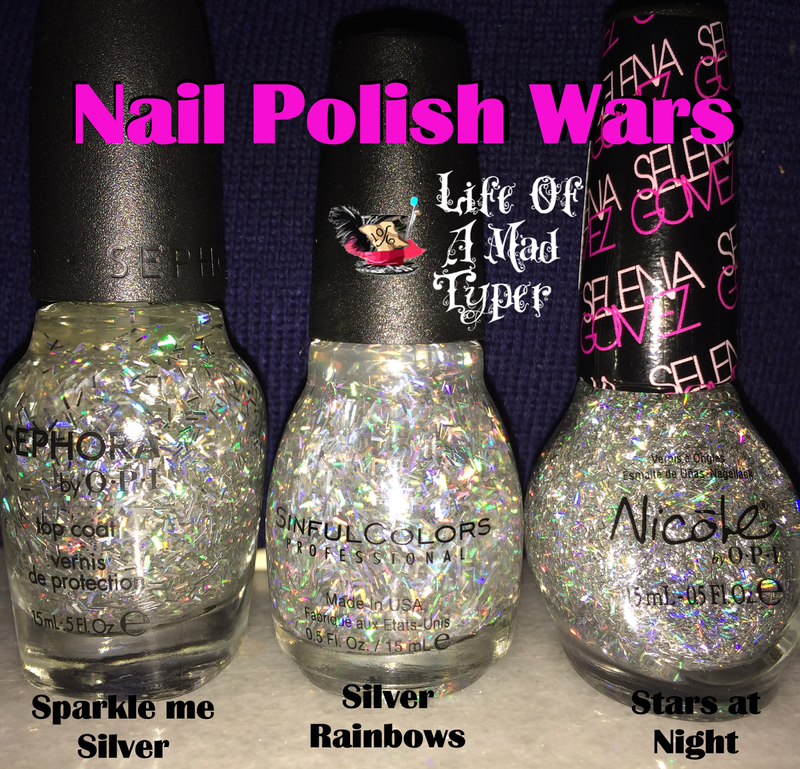 Do you have any of these polishes? What do you think of the bar glitter trend? 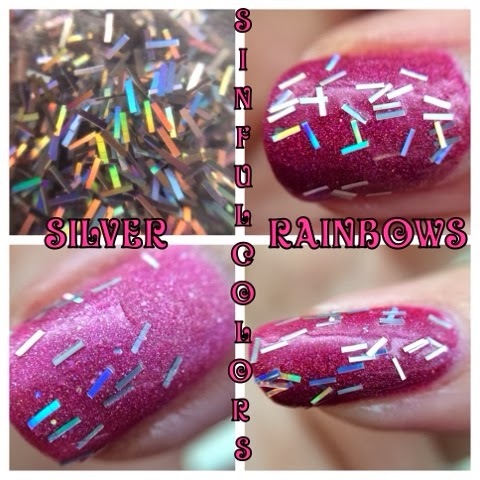 If you can't find the SinfulColors Silver Rainbows then Sparkle me silver is a close enough dupe that I would recommend checking it out.